SAN DIEGO — Since December 2011, when the Mexican consulate issued new rules on what documentation anglers needed to fish in Mexico, U.S. citizens aboard private boats and charter fishing vessels have been navigating through a confusing sea of bureaucracy to figure out what is needed to fish in their favorite Pacific offshore waters across the border. The new regulations state that commercial passenger vessels and private sport boats planning on recreating within 24 miles of Mexico’s coast must obtain a Multiple Migratory Form (FMM) permit, show a passport or valid ID and make a tourist immigration rights payment of 294 Mexican pesos (around $23) before their trip. According to the Mexican consulate, the rules apply to all U.S. citizens on boats involved in recreation activities including fishing, whale-watching, scuba diving and snorkeling. The new regulation was explained in a letter from the Mexican consulate in February — but after reportedly discovering that many of the charter sportfishing vessels and party boats were not adhering to the FMM permit requirement, Mexican officials began stepping up patrols in July. Since then, San Diego’s fishing fleet has been staying out of the popular three-quarter-day and 1.5-day charter boat fishing areas around Los Coronados islands and farther south. While the sportfishing fleet was originally working with MX Tour Assist — an agency developed to issue the permits stateside — paperwork delays and higher prices caused the fishing fleet to suspend the service. Phil Lobred, owner of H&M Landing in San Diego, said MX Tour Assist was also charging about $33 for the FMM permits, due to handling fees, making the permits a costly endeavor for anglers already paying for a spot on the boat and a Mexican fishing license. “Their prices went up several times, and it was getting pretty cost-prohibitive to use them,” Lobred said. At Mission Bay’s Dana Landing sportfishing, sales associate Bubba Newton said MX Tour Assist was utilized by the fleet initially, but he was no longer sure if the company was even issuing permits to commercial vessels anymore. Calls and emails sent to MX Tour Assist by The Log Newspaper were not returned by the company, at press time. While MX Tour Assist is no longer working with the commercial passenger fishing fleet in San Diego, private sportfishing boats and private recreational vessels reportedly can still obtain permits from the company, which is now located in offices at Kona Kai Marina on Shelter Island. In addition, anglers who want to fish along Mexico’s coast still have the option of picking up a permit by land at the Tijuana immigration office or by sea at the Port of Ensenada. “We haven’t heard of any boats dealing with any issues, as far as the Mexican navy harassing anyone, but it seems like they are more focused upon the sportfishing fleets than the private boats in their waters,” Newton said. 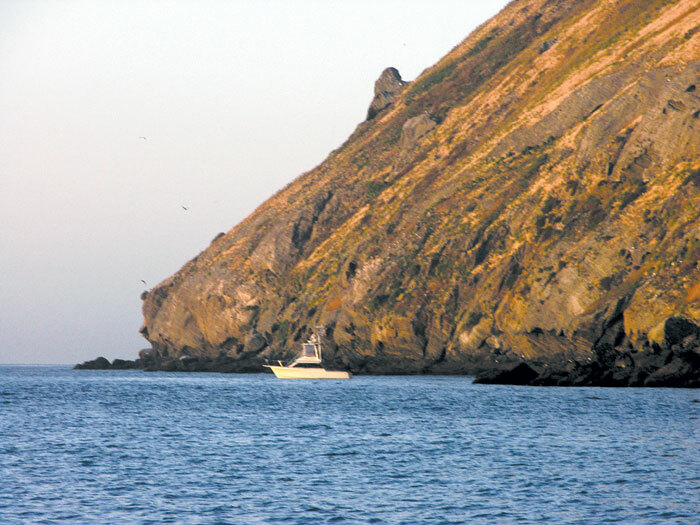 With the area essentially closed to commercial charters, the fleet has been focusing on offshore trips for yellowtail and inshore trips to La Jolla this summer, limiting fishing opportunities for one of the largest sportfishing fleets in the nation. Ken Franke, president of the Sportfishing Association of California (SAC) has been working with both the sportfishing fleet and the Mexican government on a way to reopen the waters to stateside anglers. On Aug. 6, Franke and SAC officials met in Tijuana with members from the Port of San Diego, the city of San Diego, and the United States consulate office in Tijuana to discuss the current situation involving recreational and commercial vessel access to Mexico’s territorial waters. The group discussed the current situation the sportfishing fleet finds themselves in dealing with, in regard to Mexico’s territorial water regulations. Franke said recommendations and considerations were brought up to facilitate a beneficial solution for both sides that would lead to a restoration of marine activity between the two countries. “Ultimately, we would like to see reasonable and appropriate access for these vessels that have operated in Mexican waters for decades and have had a good relationship with the country of Mexico,” Franke said. Lobred, who is also a board member of SAC, said the group is hoping to get immigration officials to designate the zone between Tijuana and Ensenada as a sort of “tourist corridor” that would allow passengers aboard sportfishing vessels access within 24 miles of Mexican coastline without a visa charge, leaving only a small processing fee for the boats to pay. “The meeting went well, and we’re hopeful they will come to a good decision on this,” Lobred said. If the “tourist corridor” discussed during the meeting is implemented, SAC is suggesting that an office be opened in San Diego where electronic permit processing could be handled for boats and passengers heading to areas within the 24-mile zone. The office could potentially be located next to the current SAC offices at Sun Harbor Marina in America’s Cup Harbor, and it could operate the way CONAPESCA San Diego operates: having a local office that administers Mexican fishing licenses to local sportfishing enterprises and private boaters planning on fishing in Mexico.